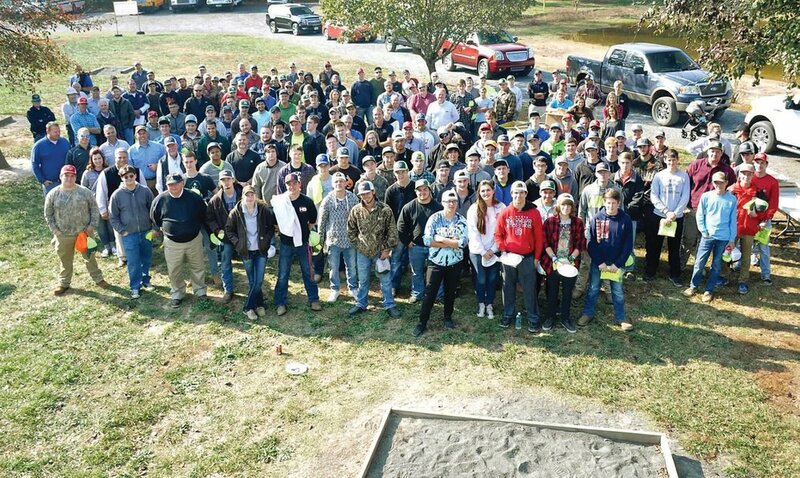 On a beautiful sunny day, over 170 masonry students from nine area North Carolina high schools converged on Ben Ketchie Park in Gold Hill for a day of masonry exploration & education. Developed by ProBlock National Director of Sales & Training, Ryan Shaver, the day included tutorials on processes and materials commonplace on a masonry construction job site. The idea for such an event evolved during Shaver’s prior stint as a high school masonry instructor. While North Carolina is fortunate to have thriving masonry programs in its schools, student exposure can be limited to a classroom setting. Students learn to construct basic masonry panels, but many never set foot on a job site to see how those units are actually installed into a wall. They do not see how products are manufactured or delivered, nor do they understand OSHA requirements for safety compliance. 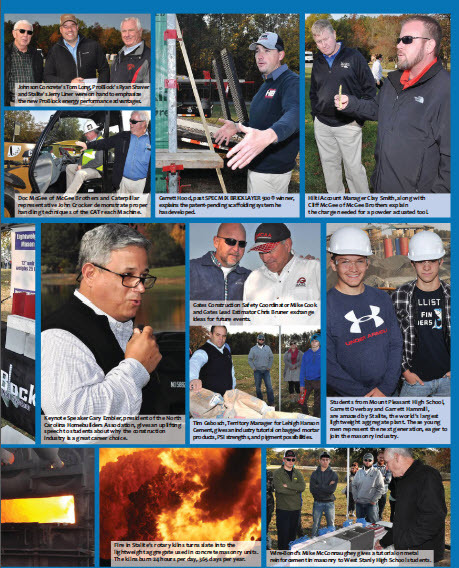 The concept behind the Gold Hill event was exposure to a variety of industries that integrate with a mason contractor’s business and to generate awareness of the myriad career opportunities connected to the trade. Tim Gabosch, Territory Manager, represented Lehigh Hanson Cement (formerly Essroc) and introduced students to the extensive range of cement-based products that can be specified by architects. Masonry cement vs mortar cement vs cement lime and Type N vs S vs M. Most of the students did not realize the level of complexity behind the general term mortar. Gabosch reiterated that the old adage stronger is better does not apply to masonry mortars and that instead, one should select the product with strength characteristics most compatible to the particular masonry unit being laid. 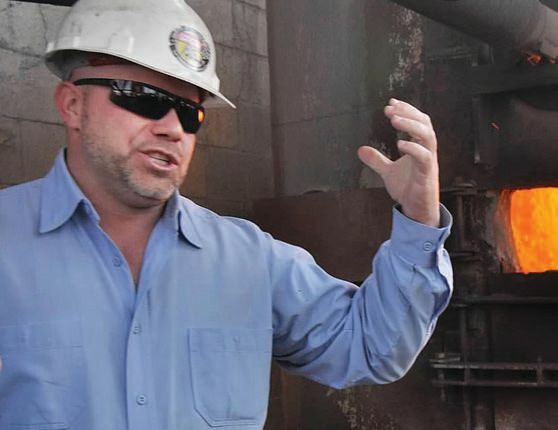 Our approach was to bring together multiple contractors, producers and industries with a connection to the masonry trade. Each presenter has had a unique career trajectory. Gabosch also touched on mortar color variation and the importance of controlling the moisture content of sand. Failure to shield a sand pile from heavy rain or failure to mix mortar with homogenous proportions will yield color inconsistency. Representative, Wire-Bond, explained the mechanics of masonry reinforcing wire in conjunction with block and brick. Students learned about truss vs ladder wire, single wythe vs cavity wall construction, and how to select the appropriate type of hook and eye wire based on block depth, type of insulation, air space and veneer size. They were taught wire spacing requirements per code and how control joints, mortar catch devices, and flashing should be integrated into the wall for crack control and moisture management. Members of the Johnson Concrete sales team demonstrated the use of specialized concrete masonry products such as 45-degree blocks, hollow headers, ProBlock, and integrally colored architectural units. Johnson Concrete Western Division Sales Manager, Gregg Swartz, believes that concrete masonry is a superior building material but that its value and versatility can be underestimated. “So many people think of concrete masonry as confined to grey cinder block. If one of these students becomes an architect or an engineer, I want to make sure he or she knows that concrete masonry is available in countless shapes and sizes with colors and finishes to meet most any design aesthetic. These students also need to be aware of the energy performance and cost savings of single wythe masonry, especially when using ProBlock.” Through reduced thermal bridging, ProBlock is an essential component in a structural wall system that optimizes energy performance and has the capacity to exceed performance requirements per ICC code. Johnson Concrete also had one of its best truck drivers, Billy Stancil, educate students on how his daily routine supports the masonry industry. Stancil’s opening words were, “I’m a truck driver and I love my job.” Recognizing that he’s the first point of contact between a material supplier and its customer, Stancil stressed the importance of timely service, adapting to customer needs, and staging material in a way that benefits the masons in working most efficiently. He discussed challenges frequently encountered when at a job site and demonstrated how to offload material using a truck mounted forklift. John Crocker, Sales Representative at Carolina CAT, presented students with three of the most popular pieces of construction equipment: a Mini Excavator, a Skid Steer Loader and a Compact Telescopic Lift. Crocker demonstrated how to operate each piece, explained the application of each piece on a job site and highlighted performance specifications. Hilti North America Account Manager Clay Smith represented and introduced students to a plethora of tools used to maximize efficiency during masonry installation. Students were able to operate a hammer drill and see how a powder actuated tool inserts an anchor into a structural backup that then ties into a brick veneer. Mason contractors demonstrated the use of a quick saw and explained that, while sawing is necessary, it slows productivity and can sometimes be avoided by more thorough planning. Smith explained how government regulation coupled with the need for protection against silica has led Hilti to develop dustless technology that is now commonplace on job sites. Two products for reducing silica exposure were on display: a vacuum that attaches to grinders, drills and saws and a proprietary drill bit that directs dust into a vacuum. Smith also introduced students to Hilti’s two part epoxy that creates a chemical reaction strong enough to hold rebar in place after boring into existing concrete or masonry. Three types of scaffolding were erected so students could envision how each system could be most appropriate under different job site conditions. Jeremy Bouska exhibited a motorized hydraulic scaffolding system from Klimer that runs off a gasoline engine. With a lift that will climb 30' in one minute, a deck that can be extended up to 60', and a large platform for staging material, students quickly understood its usefulness at a large commercial job site. Eric Yates of Lynn Ladder & Scaffolding Company showcased traditional steel frame scaffolding. After highlighting its stability and safety rails, students were able to walk along the planks and visualize how it could be erected in tight workspaces and be easily adjusted to meet multiple height requirements. 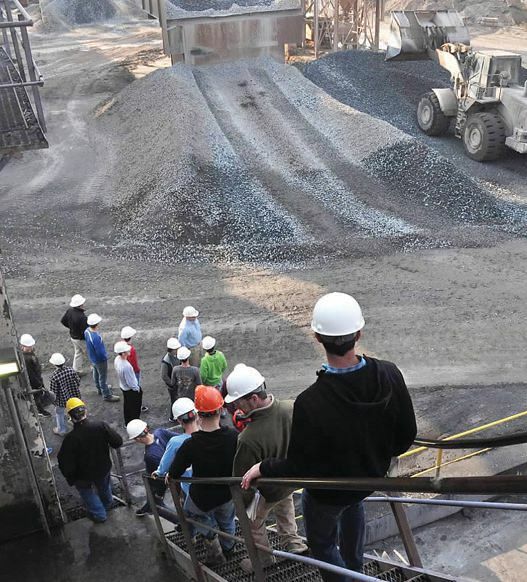 Students exit kiln deck to view Stalite's facility in Gold Hill, North Carolina and learn about the process required to mine slate for the production of lightweight aggregate. Stalite's high strength material is used globally in lightweight structural concrete and regionally in concrete masonry units. 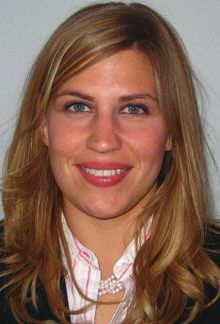 Johnson Concrete founder Allen Starling Johnson Jr.'s granddaughter, Starling Johnson Kaklamanos, gives a tutorial on the many shapes and sizes of CMU and the labor saving efficiencies gained from using ProBlock. Stalite Supervisor Ronnie Hamrick explains why rotary kilns are ideal for producing lightweight aggregate. Also on display was Hood Scaffolding, a new patent-pending development that is the brainchild of Huntley Brothers Masonry Superintendent Garrett Hood. Hood experienced difficulty finding replacement parts for his pump jack scaffolding after all manufacturers had gone out of business so he decided to build the scaffolding himself. By replacing wooden poles with nonslip steel poles, Hood has improved durability, increased safety and created a system ideal for residential and lightweight commercial construction that can reach up to 24' vertically without bracing and a maximum height of 48'. A highlight for many in attendance was a guided tour of Vulcan Materials Company’s Gold Hill Quarry, and adjacent Stalite, the world’s largest lightweight aggregate plant. While watching slate process through rotary kilns and heat to 2200°F / 1204°C, students saw firsthand how Stalite’s expanded aggregate reduces the weight of a concrete block. Not only is lightweight block easier to lift and lay, it has better fire resistance and energy performance. They learned about aggregate gradations, ASTM density classifications, optimal mix designs, and rigorous strength testing standards for CMU. The day finished with keynote speaker Gary Embler, President of the North Carolina Homebuilders Association. Embler stressed to the students how fortunate they are to have been born in America, blessed with the unalienable rights of Life, Liberty and the pursuit of Happiness. “You can do anything you want when you combine the talents you have been given with effort. If you do what you love, you never work a day in your life. Sometimes children feel pressure to follow only one path: grow up, go to college and get a desk job. But that path doesn’t work for everyone. Young adults who enjoy being outside or who want to own their own companies one day need to be empowered to choose a different path and learn a trade.” Embler also cast a spotlight on the shortage of qualified masonry professionals, stating that construction workers left the industry during the recession and now need to be replaced as the economy has recovered. This imbalance has led to a spike in wages and a demand for masons that he believes will continue. Mason Contractors found the event to be a valuable platform for recruiting high school seniors to the masonry industry and also to their respective companies. Greg Huntley, General Manager of the McGee Brothers Greensboro location, is a sixth generation bricklayer. Having started laying brick at age thirteen, and having worked for McGee Brothers for 34 years, Greg personally knows how rewarding a career in masonry can be. “Aside from masonry, my passion is flying. The masonry industry has allowed me to fly an airplane back and forth to work every day. Opportunities for success are there if you’re willing to work for it. I wouldn’t trade this career for anything.” Cliff McGee, also of McGee Brothers, echos the sentiment. “College isn’t for everyone. People need to know that you can have a very long and lucrative career in masonry.” Generation after generation. 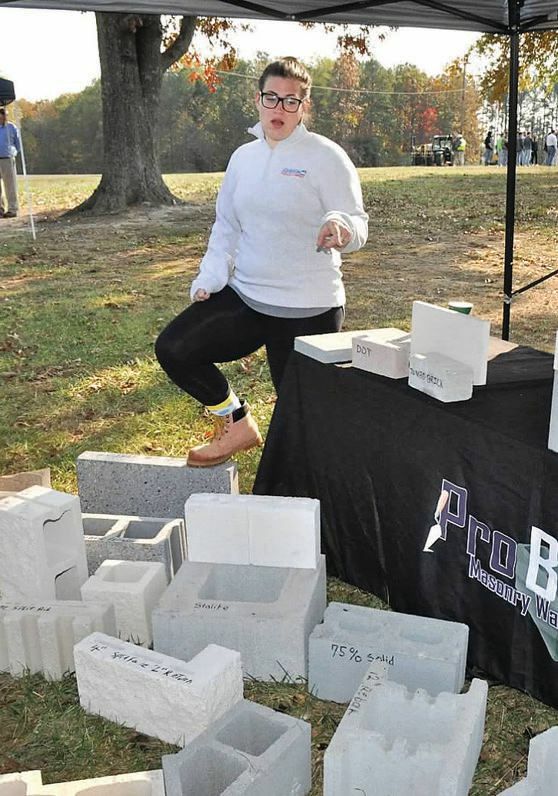 ProBlock, Johnson Concrete and Stalite sponsored the Masonry Education Day in Gold Hill and have plans to host another similar event for schools in eastern North Carolina. Lunch was graciously prepared, served and donated by mason contractors Huntley Brothers Company and McGee Brothers.